S.O.U.L Sisters Leadership Collective | Miami S.O.U.L. Sisters GNC Caucus – Now Recruiting! Miami S.O.U.L. Sisters GNC Caucus – Now Recruiting! S.O.U.L. 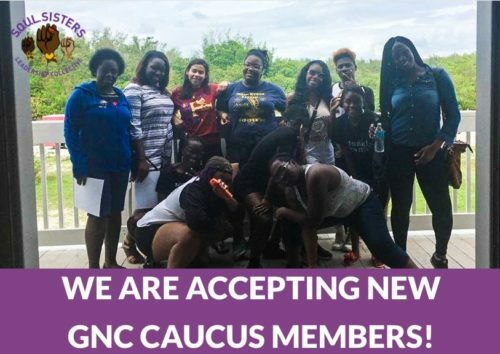 Sisters Miami is accepting new members to our Gender Non-Conforming (GNC) Caucus! We are committed to creating intentional spaces for those who fall in and out of the gender binary. We welcome all non-binary and gender non-conforming (GNC) folks between the ages of 13-21 to apply. Members can expect to engage in leadership development, community organizing, social justice, art, in-state and out of state trips, school readiness prep and more! This summer, GNC Caucus members will support development of our SOUL Program, which focuses on 9th graders at risk of court involvement and/or high school dropout, and provides biweekly leadership development, social justice education, college and career readiness, and healing opportunities. Members will also receive stipends for their work in the caucus. Application deadline extended to Sunday, May 27 @ 11:59 PM. Apply here today! For any questions or concerns, please contact Logan Meza at logan@soulsistersleadership.org or (305) 571-9601 x 113.